It has been ages since I did a post about knitting. Mostly because it's been ages since I did any knitting. However, while we were on vacation, I decided I needed something different to do, rather than continuing to work on La Passacaglia. I'd finished off the last of the large rosettes on it, and didn't really want to start the new small ones until I got it all up on the design wall and checked for colour balance. 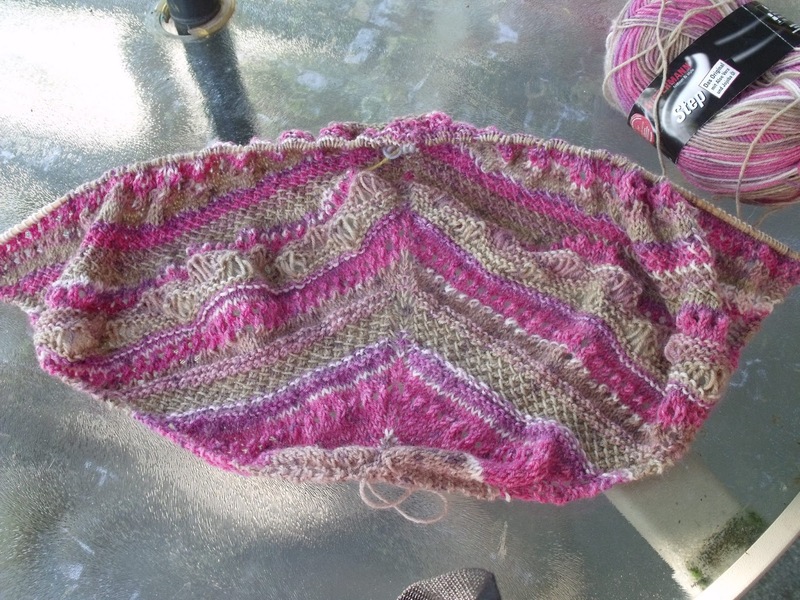 So, I'd packed some wool, and I'd packed some knitting needles, and decided to start on a project that I'd seen Judy make Pamuya, a lovely shawl. I've never made a shawl before, and never used a shawl, either. But I really liked that sampler stitch quality of Judy's finished project. 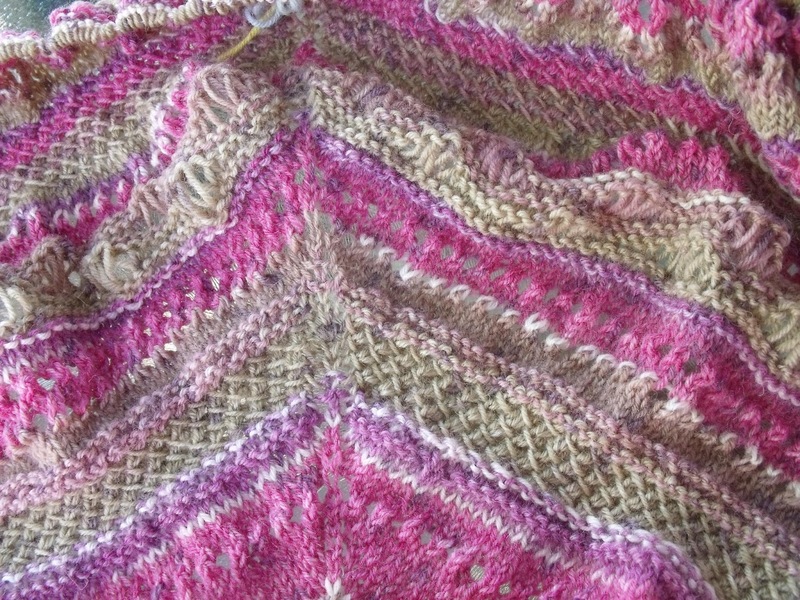 It sat in my Favourites on Ravelry ever since I saw it, while I dithered about whether to make it, or not. I finally purchased that pattern, and also one for a Cowl called That Nice Stitch, and took both with us on vacation. What finally made the decision was discovering that I hadn't brought the crochet hook I needed to do a provisional cast on for the cowl. I am really enjoying knitting this. 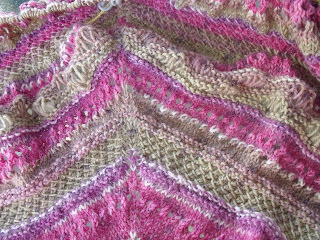 There's enough sameness about it to make the knitting easy, while the different stitches make it interesting to work on. I have two balls of this yarn, which should be plenty to get this done. When it gets done, well that's something else altogether. Although, there are some more long car rides coming up in the month of August, so it just might get done then. In the meantime, I'll enjoy the process. I'm linking up to Judy's On the Needles. 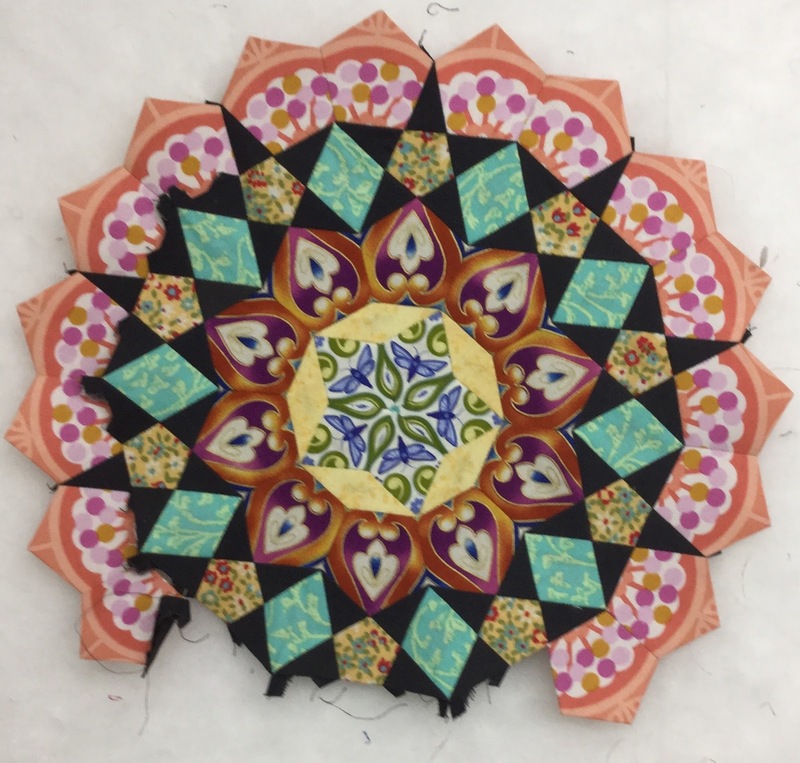 Not that quilting is work, but after three weeks vacation, it takes a while to figure out where I am, and what I'm doing. Yesterday was spent mostly doing phone calls and catch up things. 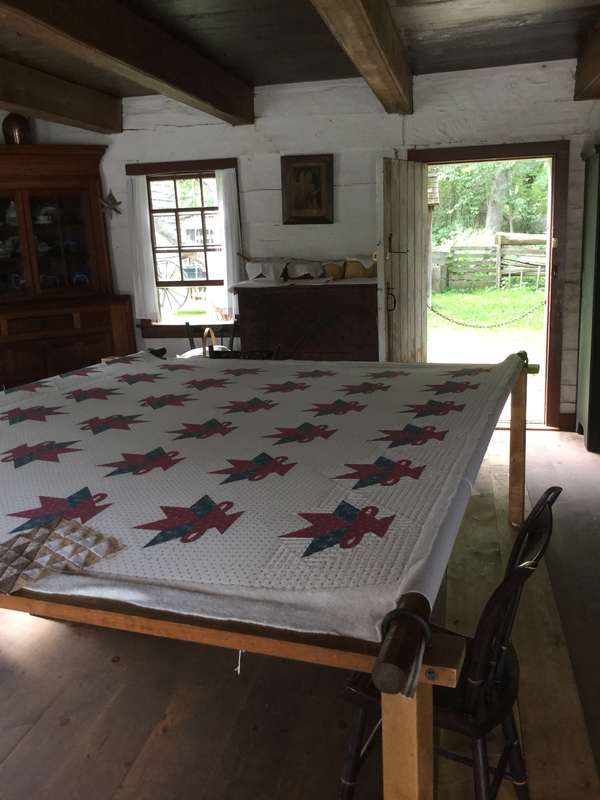 After that, I came up to the studio to check in on which customer quilt was up next. 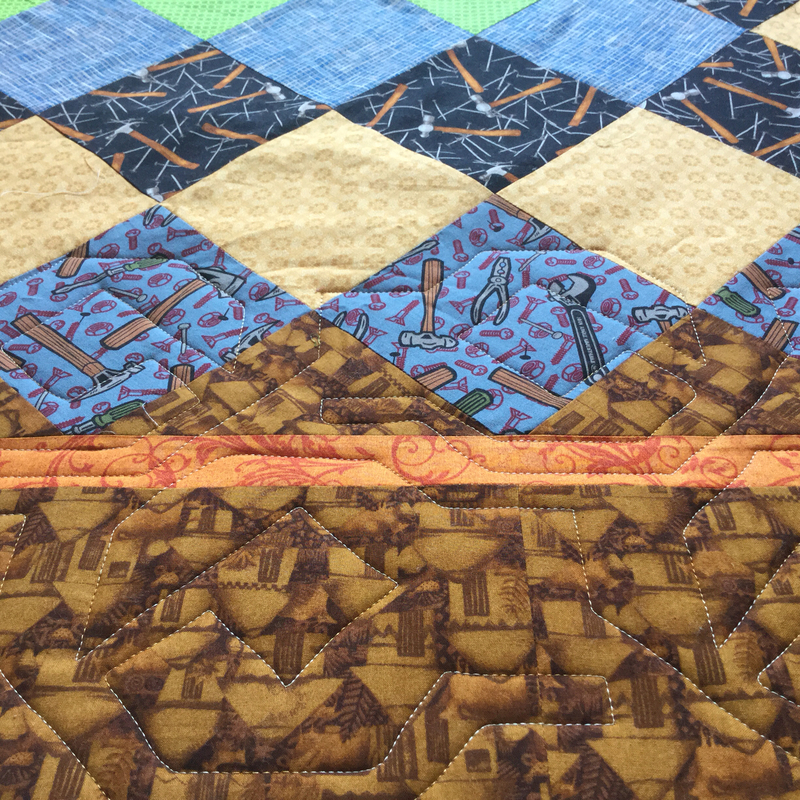 Turns out, it's the last of a group of three quilts for a small guild in the St. Thomas area. 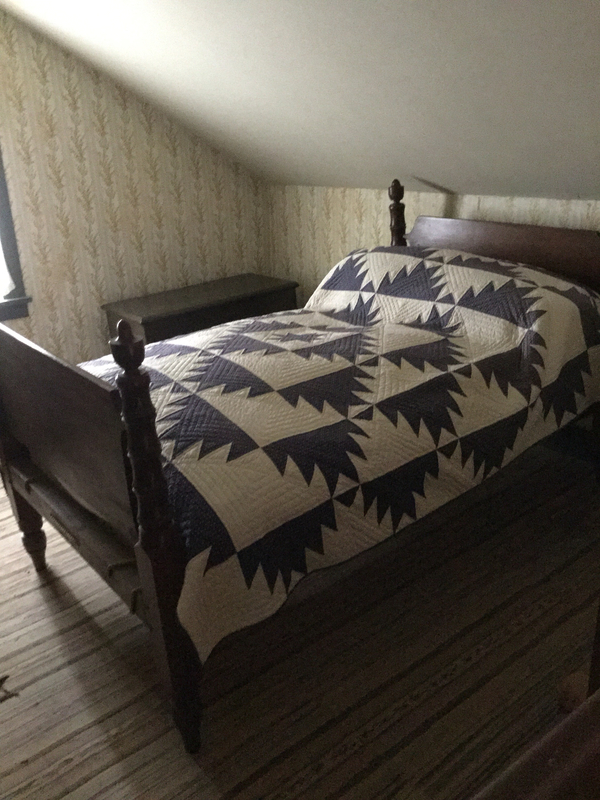 They make quilts for chemotherapy patients, and they had so many tops waiting to be quilted, that they decided to hire three of them out. This last one required the purchase and download of a new pantograph from Digitech Designs. The last part of yesterday afternoon was spent drawing it up. I love looking through that web site at all the different designs. It can be quite the time gobbler. This is the design we decided on. It's called Nutz and Boltz. It's going on this quilt with the fun tools fabrics. 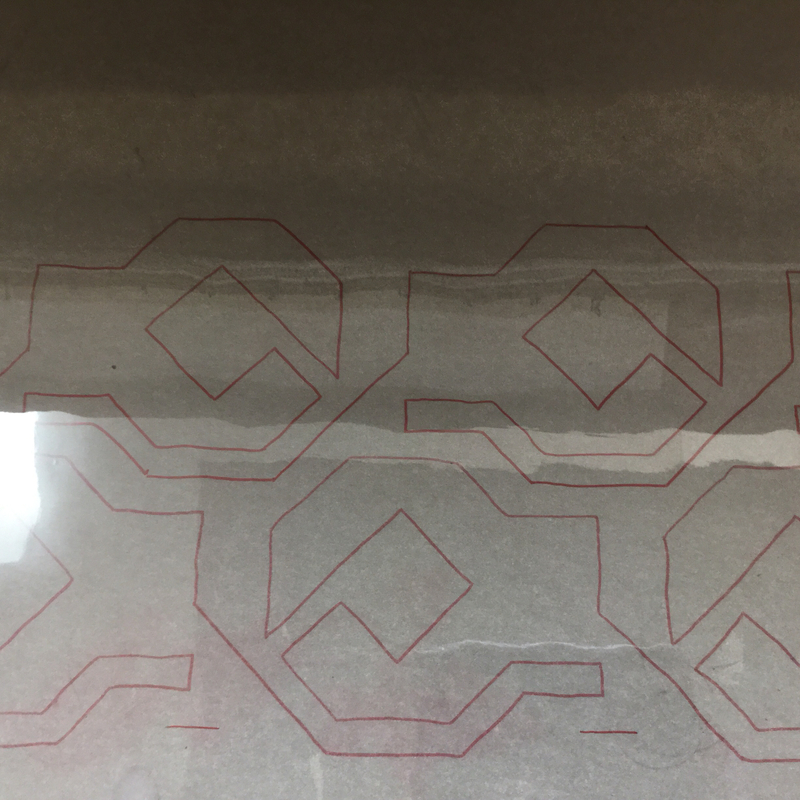 I have one pass of the design done, so this is a bit of a sneak peak. The rest of yesterday afternoon was spent knitting while waiting for 2 1/2 hours to see my doctor. Our pharmacy didn't like the way one of my prescriptions was written, and they wanted clarification. To be fair to them, I wasn't taking the medication as ordered, so it did need to be reordered. However, the snag came when I called the doctors office and found out that he's going on vacation next week. That meant I had to go in to see him at the after hours clinic which started at 4:30. I arrived at 3:45, knowing how long the waits are, and didn't get out until 6:30. I got a lot of knitting done in that time period. I can't imagine sitting there for that length of time with nothing to do. Today was a run to the bank and to the drug store day. Now, I'm free to work on this quilt. I'm hoping to keep going today until it is done. 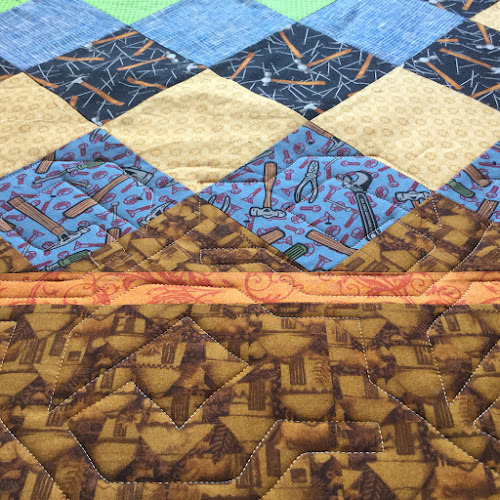 A customer is dropping off a rush quilt this evening, and I also want to get started on writing up the instructions for a free sampler that I'm doing for the guild's blog starting in September. So, lots to do and if I'm going to get it done, I'd better get at it. I've missed several weeks of stash reporting, since we've been away on vacation. We arrived home Friday evening, around 8 pm, parked the trailer in the driveway..... well, truth be told, our son-in-law Matt parked the trailer in the driveway. We removed the essentials, and the rest remains up there. We had a nice drive home, through some lovely country. We've never been to Eastern Ontario before, so it was nice to see it. There were several provincial parks that we passed on the way home that I would love to have checked out, but we were on the express to get home, so there were no detours, and no stops, other than gas. There are definitely advantages to traveling with a mobile kitchen and bathroom. While we were away, we stopped at a number of shops that were participating in the Row by Row Experience. I had thought we got to four shops, but when I unpacked my purchases, I found there were five row kits. I think, once I get them together, it will be a fun momento of this summer's travels. 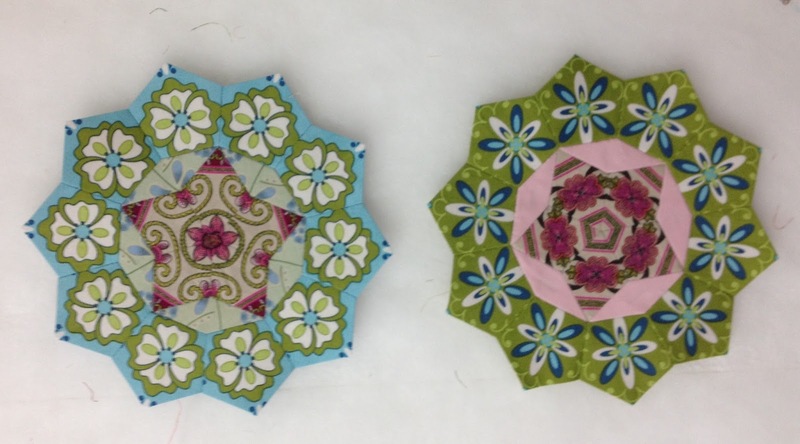 I've been working away at the last of the small rosettes for La Passacaglia. If I count correctly, I have nine left to do. I finished the second of these today, and then started another one. I'm going to leave deciding on the star points until I have all the centres done. That way I can get a better idea of colour balance. Here's a closer look at one of them. So, now I have to come clean about all the fabric I bought while we were away. 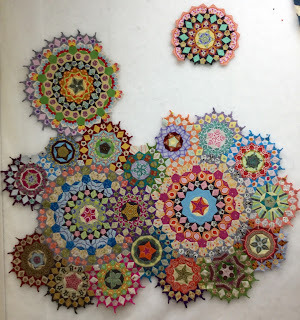 There are some large scale florals, for the Disappearing Four Patch swap Jannette and I are doing. There are the kits for the Row by Rows. Some greens I picked up because I thought it would be fun to do a quilt inspired by all the different greens we saw while on our hikes, paired up with light blue background to represent the sky. And some more Kona solids for the star points for La Passacaglia. I haven't got pictures of the fabrics.... sorry. So, now I'm going to finish off the evening with more slow stitching. Tomorrow is back to business again. 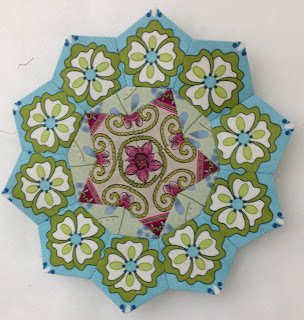 I'm linking up to Judy's Fabric Report, Kathy's Slow Sunday Stitching and Angie's WIPs Be Gone. We went to Upper Canada Village today. On the drive from the campground to the village, we just happened to do a little bit of a detour to Prescott, where there was a store participating in the Row by Row Experience. I picked up one of their row kits, and a couple of large scale florals that I couldn't resist. The rest of this post will speak for itself. Pictures of reproduction antique quilts found in the various houses in Upper Canada Village. 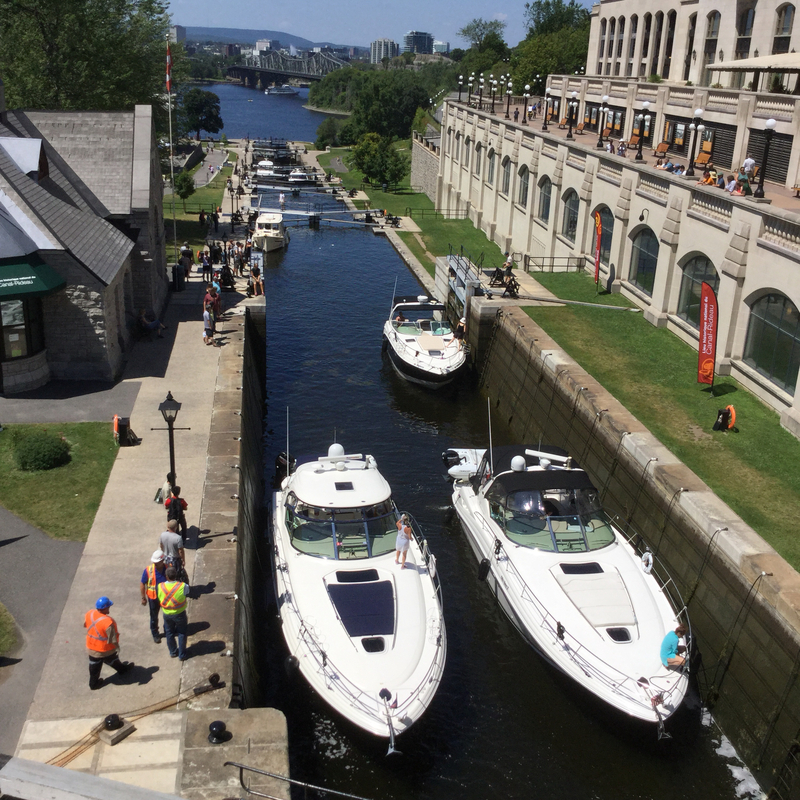 We spent today touring around Ottawa. Before I go any further I have to say that it is a nightmare of a city to drive in. We went around in circles I haven't any idea how many times because the place we were trying to get to couldn't be got to because of one way streets. All I can say is the maps app on my iPad was indispensable. Once we finally found someplace to park the car, we were able to walk to where we needed to be. The goal for our first day was to tour through the parliament buildings. We weren't able to get onto one of the centre block tours, but we did get to go through the east block. 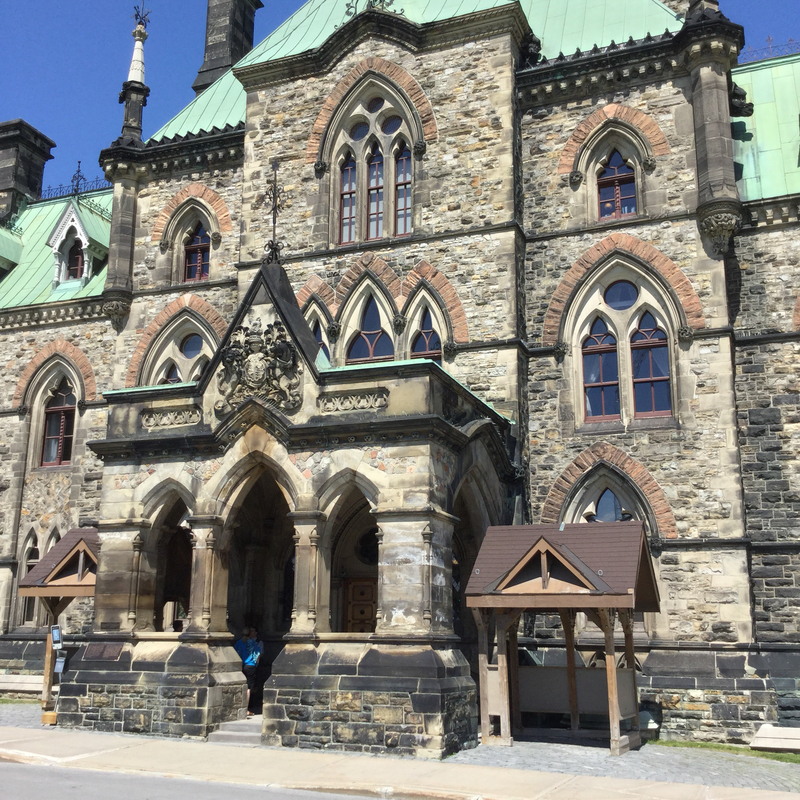 Our tour of the East block was for 4pm, so we did a tour of the outside of the buildings first. We've seen these buildings so many times on TV and in pictures, but that doesn't even begin to capture what the look like. There are a lot of statues and monuments around the buildings, as well, none of which made it into pictures on my iPad. Our guide was excellent, giving a fascinating glimpse into the history of our country and the buildings. This is the East Block, the oldest of the buildings, dating from the late 1800's. The lighting inside the building wasn't very good, so I didn't get many pictures. 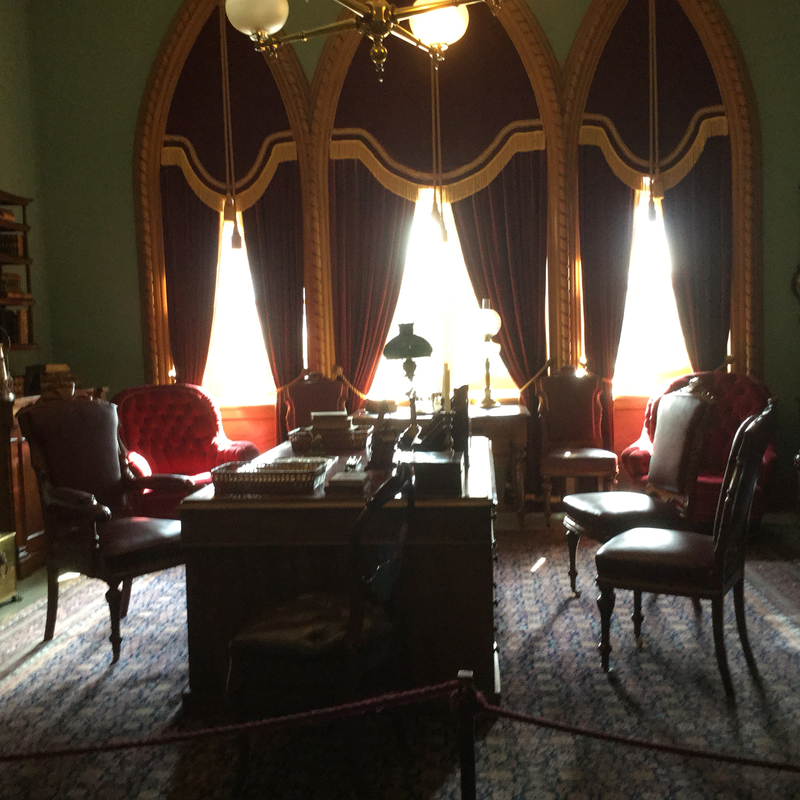 But I did get one of the office that the very first Governor General had when the building first opened in the 1870's. 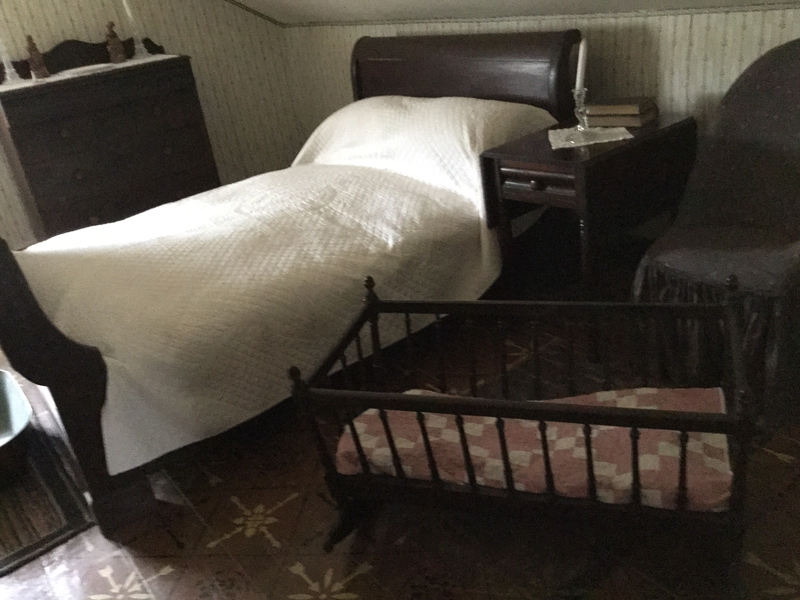 Some of the furniture is original, and some is reproduction. Our guide was very good, and was able to give us some insights as to what it might have been like to actually work in this building then. Very limited central heating then and very large windows and high ceilings would have meant being incredibly cold in the winter. After we finished our tour of the east block, we headed back to the car, passing the locks for the Rideau Canal on the way. We did a bit more of the driving in circles without being able to get where we were going while we tried to find the National Art Gallery. We did finally succeed, and also discovered the wonderful fact that there is parking right under the gallery. So, depending on the weather, we'll head there tomorrow. There's a sixty per cent chance of rain tomorrow, so it might be a good day to spend inside. 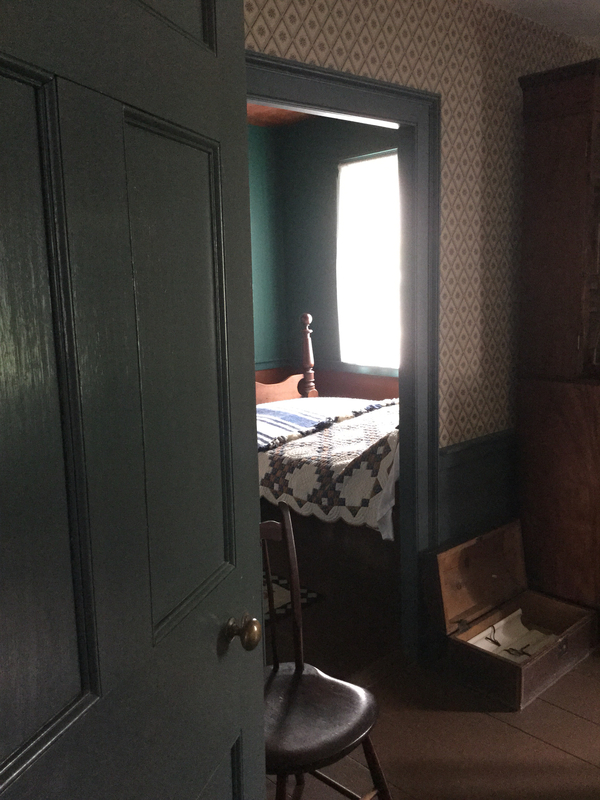 We still want to do the tour of the centre block of parliament, and also want to go see Upper Canada Village. 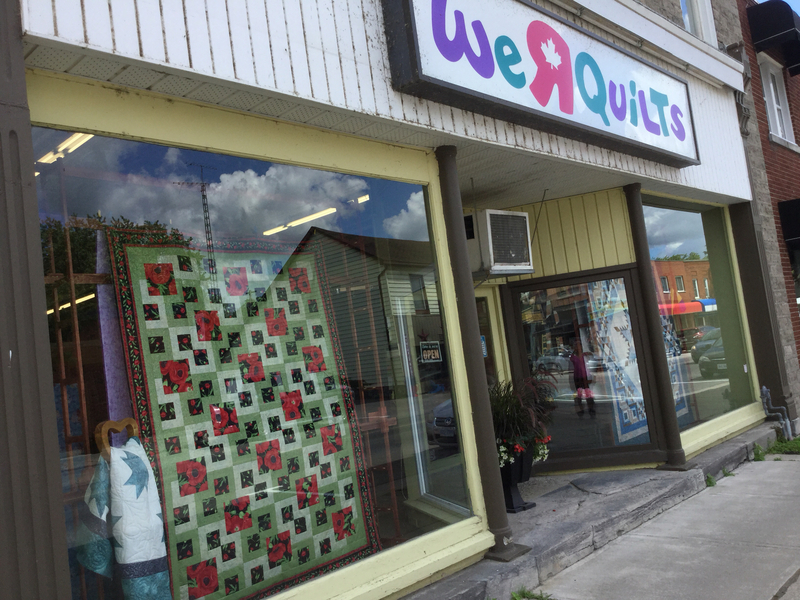 Also on the itinerary are a couple of quilt shops that are participating in the Row by Row Experience. We moved on in our travels today and came over to the Rideau River Provincial Park. At first impression, it's a nice one. Large private campsites, easy to get into with the trailer. We're going to be doing a small amount of touring around Ottawa for a couple of days. 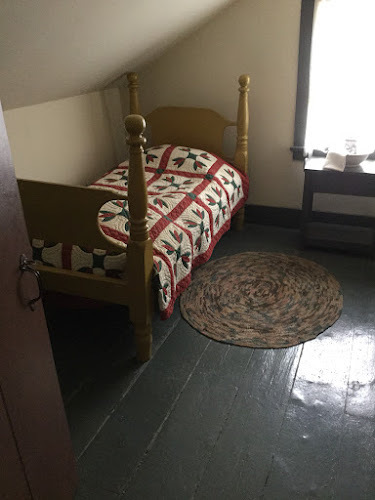 And we also want to go down and see Upper Canada Village. 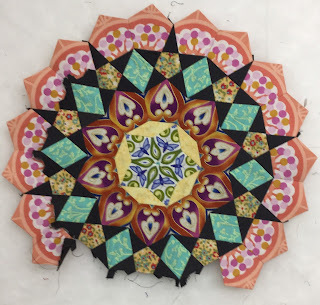 I finally managed to get my last large rosette done for La a Passacaglia. I took a picture of it in our campsite at Lake St Peter. And here it is all spread out. I've started some smaller ones now, but don't have pics of them. I'm using my iPad for this post, so I won't be doing any linking. Saturday, we took a drive into Algonquin Park to do one of the trails. 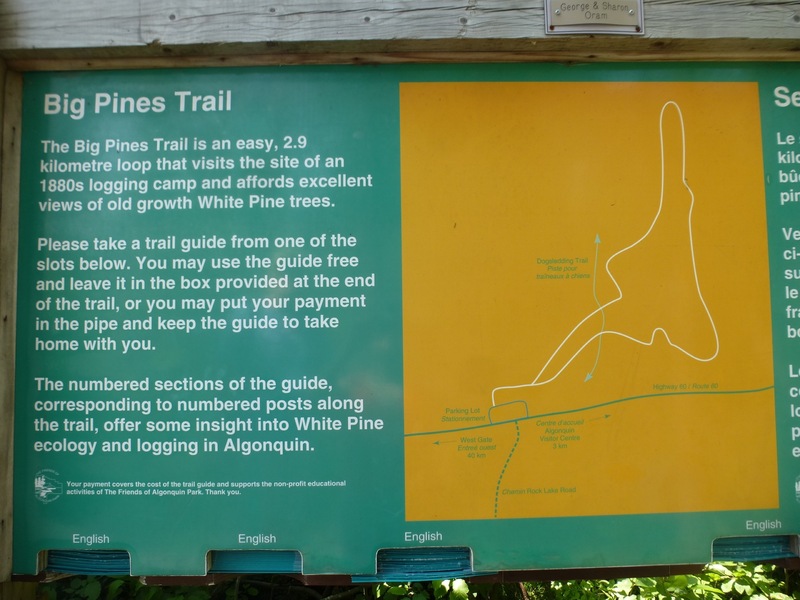 One of the trails closest to us is the Big Pines Trail. It meanders through a portion of the park, filled with enormous pines. This past of the park had been logged sometime in the past, but there were a few trees that the loggers missed. 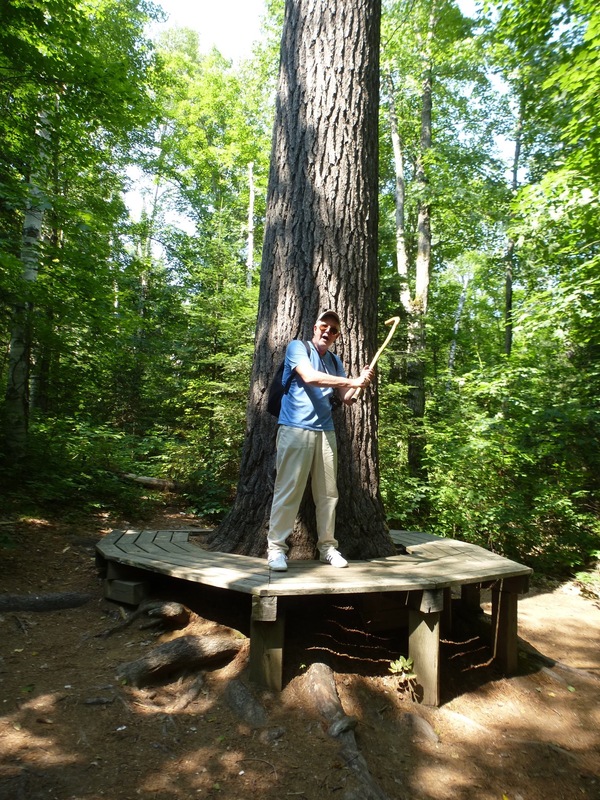 I got a few pictures of these huge trees, incuding one that had a bench built around the base. Scott decided to do a little batting practice with his walking stick. I found it really amazing how some of these trees were able to grow, given the conditions. 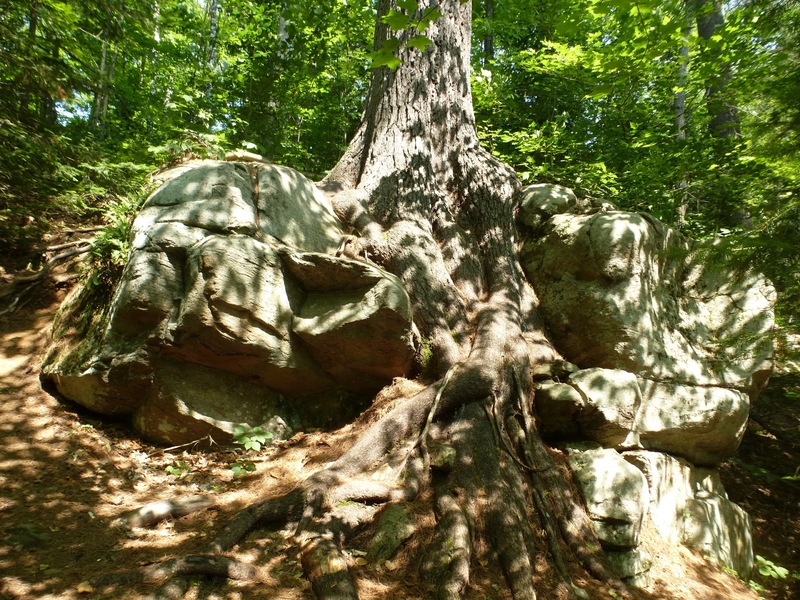 the roots of this next one completely surrounded and grew over top of this large rock. One of the bonuses of having to keep a close eye on the ground, besides the obvious one of not tripping on rocks or roots, is seeing the small beauties that manage to grow, even in the most unlikely places. 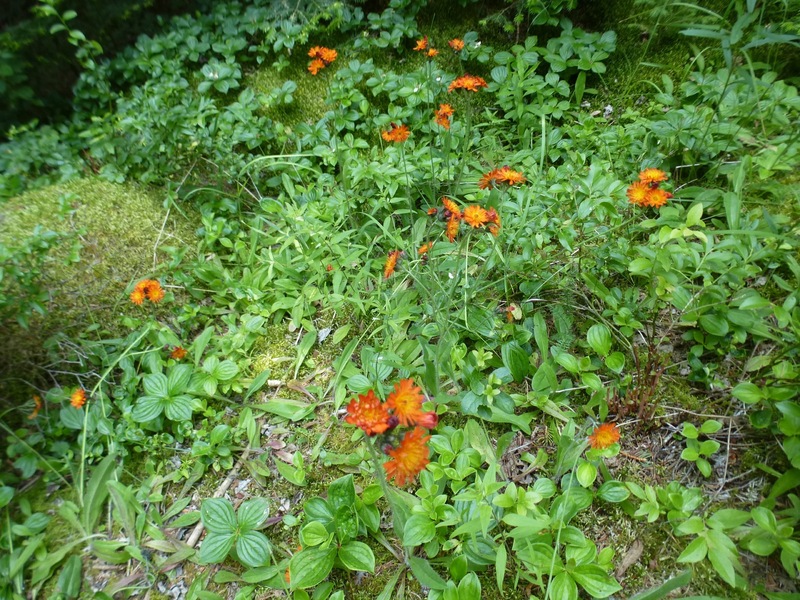 I have no idea what these flowers are, but they sure were a pretty splash of colour on the forest floor. Very close to the end of the trail, some thoughtful person placed a bench looking over a wonderful vista. The quiet was amazing. All we could hear were birds singing, and the breeze in the leaves. The photo doesn’t nearly do it justice. The depth and number of greens was amazing. 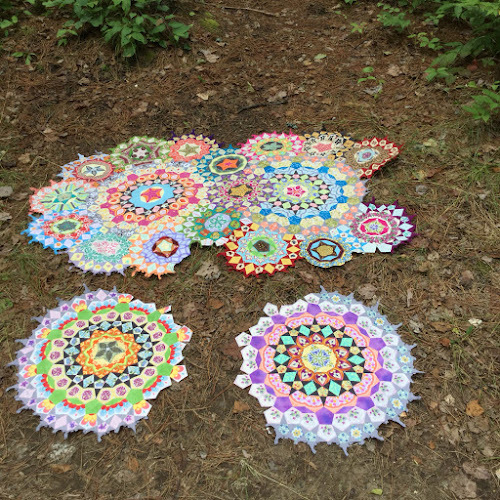 Whoever said different greens don’t work together in quilts, never sat and looked out over a meadow and forest like this one. I’m not sure when I’ll get to post this. We’ll need to make another trip to a WiFi spot. We have plans to do a drive around the country side on Tuesday. We just might stop at a quilt shop on the way in a little town called Combermere. It’s participating in the Row By Row Experience in Ontario. 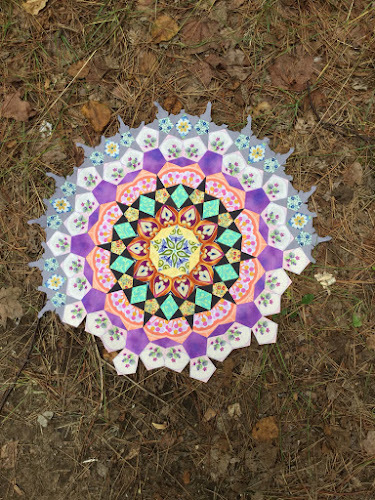 I’m trying to collect eight of the patterns and kits while we’re on vacation. It would be a fun moment of our vacation this summer. First few days of vacation. Here we are, safely arrived at Lake St Peter Provincial Park. It was a very long drive on Tuesday, all of it through pouring rain, typical for the beginning of most of our camping trips. We took the long way, through back highways, to get here. If you ever get a chance to drive it, Hwy 118, from Bracebridge over to Bancroft, is beautiful. It is very twisty and turny, with lots of climbs and valleys. 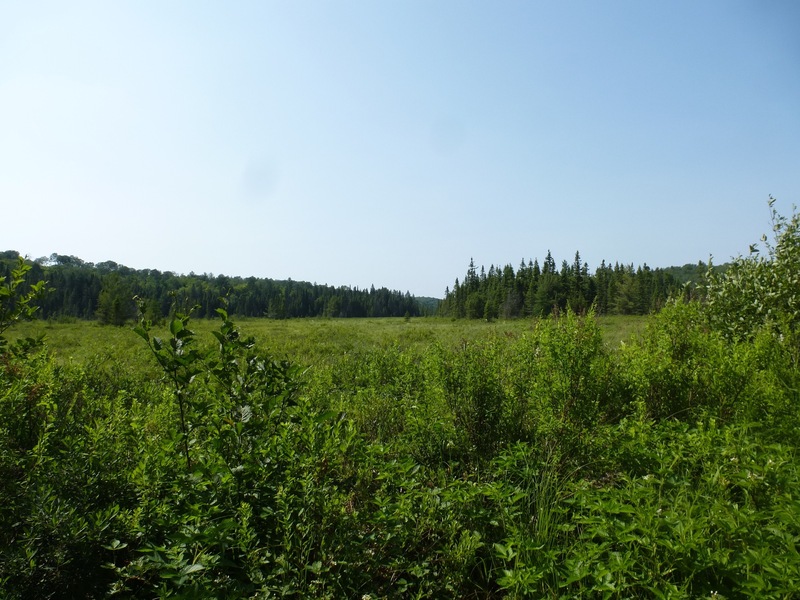 It goes through the area called the Kawartha Highlands. We didn't get a chance to stop and take any pictures, both because it was pouring down rain, and also because there were no safe laces to pull off with the trailer hitched to the car. We got all set up Tuesday evening, thankfully the rain stopped for that, since it was one of the most difficult set ups we've done. There's a bit of a slope to the front of the campsite, and we had an awful time trying to get the trailer unhitched from the car. With a lot of perseverance and some prayers for help, we finally got it. But I tell you, if I were an alcoholic beverages person, I would have indulged in a big one. By the time we were all set up, it was too dark, too wet and too mosquito infested to do any exploring. We left that for the morning. after a couple of cups of coffee, we set out to explore the campground. It is a small and quiet one, with only 60 campsites, quite a few of which are right on the lake. The lake itself is quite populated, with all kinds of homes and cottages around the edge, which was quite a surprise. We're used to coming up to this area of the country and finding nothing but wilderness. The wireless reception is quite sporadic. I can sometimes get text messages out on my iPhone, but sometimes not even that. I'm currently sitting in the visitors' centre at Algonquin Park, which has WiFi access. We could see for miles and miles. The picture really doesn't do it justice. It was quite a hard climb up to this area, but it was certainly worth it. We'll be doing more hikes as the week progresses, and I hope to post on them as we do them. I might have to put more than one at a time in a post though, since we have to come to this centre in order to get the internet access. I'm continuing to work away at the fourth, and the last of the large rosettes for La Passacaglia. These are sooooo slow to do. After this, it's just the small rosettes to fill in at the top. Maybe by the end of the summer......... but then again, maybe not.....This will be travelling with us, so it will get some attention while we're away. I have found that, depending on the condition of the roads, I can work on this while in the car. We're heading out for our main summer vacation trip on Tuesday. I am hoping to combine this trip with a bunch of things...... some resting and camping, some sight-seeing and some stops at quilt shops that are participating in the Row by Row shop hop. I've been debating off and on for the past little while whether I should take my sewing machine along with us. I have decided that, yes I will. If I can get kits at the various shops, I can actually work on them while we're away. There are bound to be one or two rainy days that could be happily spent sewing. I'm not sure if we'll have wireless reception at the first park we're going to, which is Lake St. Peter Provincial Park. It's pretty far away from any sizeable towns, so it might not have coverage. If we do, I'll do some blogging about what we're up to, various trails and stuff. If not, there will be silence until we get to a place closer to civilization, or find a place with cellular coverage. I know the visitor centre in Algonquin Park has reception, so we can always head up there a couple of times. There are some trails there that we'd like to do. I haven't had a lot of stash use that I can count. A few more rows on Texas Chain, and that's it. I'm pretty sure there will be stash added while we're away, so the stash added numbers will be going up, which is always so much fun. 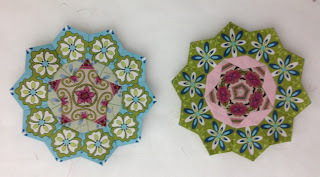 I'm linking up to Judy's Fabric Report, Kathy's Slow Sunday Stitching and Angie's WIPs Be gone. Then I think I'll see if the is anything interesting to listen to on the TV while I try and finish up this round on the rosette.